At 118/3 during Kolkata Knight Riders’ chase, the lights went off - short circuit was to blame. Post the brief electricity blackout, Russell and Gill produce some electric hitting to nail the match. At 118/3 during Kolkata Knight Riders’ chase, the lights went off— short circuit was to blame— at Eden Gardens in one of the High Court-end towers. Still 64 runs were required off 28 balls and the hosts were behind on the Duckworth-Lewis par score—126. Play resumed after a 14-minute stoppage and Rashid Khan removed the well-set Nitish Rana off the first ball after the break. Rana’s 47-ball 68, opening the innings because Sunil Narine had injured his spinning finger while fielding, was a top effort. But KKR needed something extraordinary to pull off a heist. Andre Russell was at the crease, strong-armed enough to smash any attack to smithereens in this format. Sunrisers Hyderabad’s stand-in captain Bhuvneshwar Kumar, though, bowled a terrific over and conceded only six runs to make things even tougher for KKR. The asking rate went over 17; 53 runs required off 18 deliveries. And Russell exploded. Siddarth Kaul bowled the 18th over, starting with a half-volley and Russell cleared the front leg and hit it over deep mid-wicket for a six. The second ball, a low full-toss, went over the straight boundary. Kaul looked clueless. He bowled wide outside the off-stump. But Russell used his reach to club a four past extra-cover. The game still hung in the balance. Kumar was bowling the penultimate over and given his reputation as a death-overs specialist, SRH had their nose slightly in front. But Russell just laid into the frontline India seamer. Two fours and two sixes in that over took the game away from the visitors. Shubman Gill put the finishing touches, hitting a couple of maximums off Shakib Al Hasan to secure a six-wicket win for his team, with two balls remaining. Russell, meanwhile, was unbeaten on 49 off 19 deliveries at the other end. 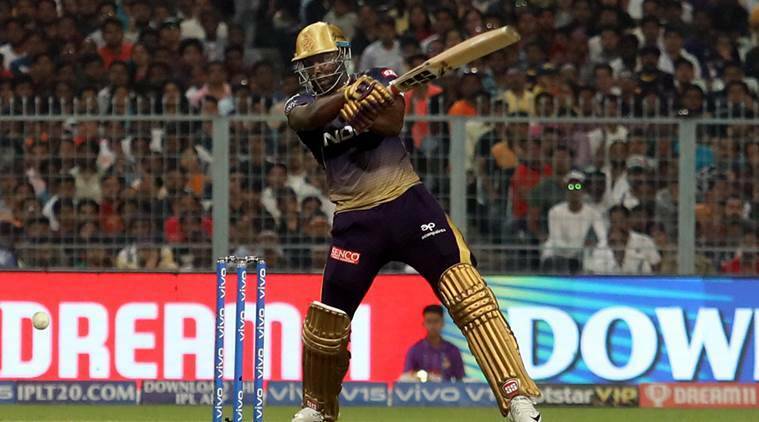 Yet again, the Jamaican proved to be KKR’s batting x-factor. To paraphrase Malcolm and Angus Young of AC/DC fame, this IPL has provided David Warner with the opportunity to let loose from his suspension noose – his exploits in the Bangladesh Premier League (BPL) were a relatively low-key affair. The IPL is T20 league cricket’s gold standard. Warner was back in Orange. A 53-ball 85 on his IPL return spoke volumes for the Australian’s character and resolve. It wasn’t vintage Warner by any means. He was a little scratchy to start with and although he grew into the game as overs passed, the left-hander was struggling to time the ball to perfection. Rust accumulated over an elongated cricketing non-action, however, hasn’t subdued Warner’s power-hitting—a six off a Russell slower delivery was thunderous. The sandpaper gate in Cape Town last year was the lowest point in Warner’s career. Redemption beckons. Warner’s last competitive match before this was a BPL fixture in January. Given the odds – lack of game time and an elbow surgery – the former Sunrisers Hyderabad captain played a gem. If he can build on this grandstand opening, his compatriots, Malcolm and Angus, might be tempted to come up with a Back in Black sequel. That’s for the future though. The real highlight of Warner’s innings was the manner in which he countered Kuldeep Yadav. Sunrisers had a great Powerplay, 54/0. Given his skill-set, Yadav was KKR’s best bet to turn the tide. Warner neutralised him, and also Narine. Over the past couple of seasons, Yadav has gradually dominated the Australian opener. Not many moons ago, the chinaman bowler had spoken about having “the wood” over Warner. Today, the latter held sway. The first ball that Yadav bowled to Warner was a little tossed up. A reverse sweep sent it to the fence past short third man. A couple of singles followed… Warner was ready to give Yadav the respect he deserved without missing out on the loose deliveries. When Yadav bowled length and allowed Warner to free his arms, a six over long-on was the result. Warner was more severe on Piyush Chawla. A couple of fours against the leggie in the second over of the match got him going. Chawla seemingly pressed the panic button and asked for a leg-before review to a delivery that had pitched way outside leg-stump. That Dinesh Karthik from behind the stumps failed to pick it was surprising. KKR unnecessarily lost a review. Warner survived two dropped catches. On 19, a Lockie Ferguson beamer floored him. The ball hit the toe-end of the bat and went to Robin Uthappa at mid-wicket, who was slow to react. To start with, not calling it a no-ball was poor umpiring. Warner had another reprieve on 68, when Karthik grassed a sitter down leg. Ferguson bowled quick, and both batsman and ‘keeper were beaten for pace. Russell finally removed Warner, with Uthappa taking a fine, diving catch at cover this time. But by then, SRH had raced to 144/2 after 16 overs, nicely poised for a 190-plus total. Kumar made his IPL captaincy debut, but some of his decisions were questionable. Sending Yusuf Pathan ahead of Manish Pandey at No. 4 cost the visitors at least 10 runs. Pathan, not even a domestic cricket regular, looked completely out of sorts. He also dropped an easy catch at long-off to allow Uthappa a reprieve. That Vijay Shankar didn’t get a bowl bordered on the atrocious. Only about a fortnight ago, he had bowled the final over in the Nagpur ODI against Australia, bagging two wickets and helping India win the game. Here he didn’t bowl at all. Shakib was given the final over. “The last over was crucial. I think they (SRH) erred in their planning. Because the last over on this wicket against Russell and Shubman, you can’t bowl a left-arm spinner,” Rana said.